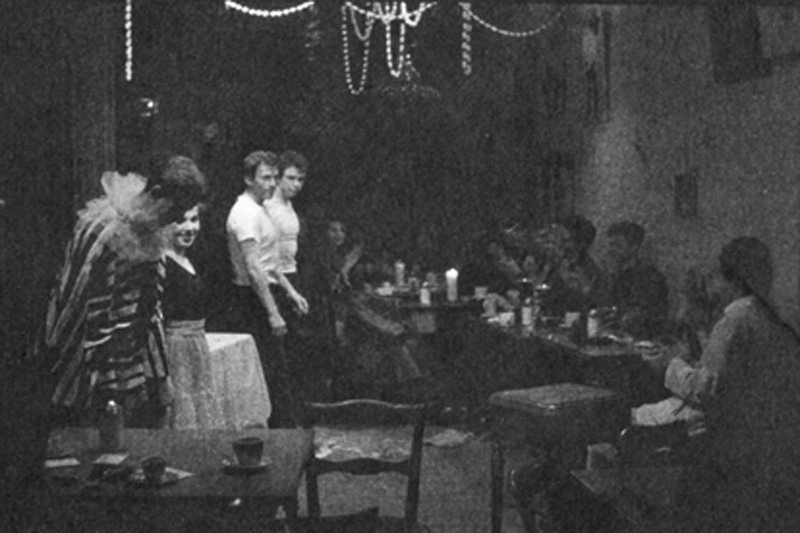 From 1958 through 1968, the CAFFE CINO in New York’s Greenwich Village presented plays on its tiny floor. LANFORD WILSON, SAM SHEPARD, JOHN GUARE, and others apprenticed there. But early shows were mainly pirated works by Williams, O’Neill, Wilder, Anouilh, and the like. The Cino later became famous for its costumed habitues and elaborate decor, but at first its casts wore suits and ties, and the walls sported art exhibits. Most early productions are lost in the shadows of what I call “The Silent Era,” but some pioneers have shared these snapshots dated 1958-63 of plays, people, and the place before its stage shone with invention, its walls fluttered with clippings, and its ceiling twinkled with tinsel. THE EARLIEST DATABLE CINO PLAY-PERFORMANCE PHOTOS are of the April, 1960 production of Edna Milay’s “Aria De Capo.” Here BILL MITCHELL, KITTY MCDONALD, PETER RATRAY, and DEAN SELMIER take a bow. GLENN DUBOSE directed. MAGIE DOMINIC sent this POSSIBLY EARLIEST KNOWN LISTING of a Cino show in the Village Voice, issue of May 6, 1959. One wonders if this might have been done by ALAN LYSANDER JAMES who we know did six Wilde programs at the Cino, the earliest known one in October, 1962? JOE CINO faces MARY BOYLAN, possibly the Cino’s most frequent actress. Bob Dahdah, Joe, and Mary are even vaguely credited with writing plays for the place. Earliest known datable Cino promotional photo, December 1958. RON FABER and HELEN HONKAMP in Dorothy Parker’s Here We Are. BOB DAHDAH, standing, directed and/or acted in pirated plays at the Cino from 1960. Frequent actor GARY FILSINGER kneels at Bob’s feet. Bob also directed original plays by LANFORD WILSON, DAVID STARKWEATHER, BOB HEIDE, EDITH LAURIE, and DONALD KVARES. See Bob’s eventual reward HERE. Unidentified play and players, against the same background as Here We Are, December 1958. ALLEGRA JOSTAD (seated center) reading French surrealist poetry with The Chamber Players, 1959. photo from Allegra Jostad/ Silberstein. HELEN HONKAMP and BOB DAHDAH, unidentified play, against ROWLAND SCHERMAN’s 1960 photo show. BOB COSTA, ELIZABETH SHANKLIN, and MOLETTA REAGAN in a popular “No Exit.” BOB DAHDAH says “No Exit” was his first production at the Cino in 1960, but JOE CINO is credited with directing a version in 1963, with some of these players. SEE Village Voice review of Dahdah’s production (the first Cino review in the Voice) HERE. LEIGH DEAN and RICHARD SMITHIES in Ionesco’s The Chairs, Caffe Cino, dated 1962. RICHARD, a novelist and singer as well, played in and/or directed a number of classics at the Cino through 1964, as well as new work by DAVID STARKWEATHER. “Silent Era” shows were often repeated. BOB DAHDAH first directed RON COLBY’s Episode in 1962, and J.D. Salinger’s At War with the Eskimos in 1960, but here’s GARY HAYNES in 1963 revivals of both (with JOE DAVIES who directed the Episode revival). Photos courtesy Gary Haynes. RON COLBY adds in an e-mail, Mar. 25, 2009: “JOE DAVIES played the lead in my play “Episode,” at the Cino, and then against my wishes took it over to the then-fledgling La Mama, because he couldn’t get enough. “ READ “Episode” HERE. Unidentified couple in the same setting as the December 1958 “Here We Are” photo. Pre-existing plays continued to be done even after the Cino had become known for original works. Above: MARION GAINES, MARY BOYLAN, and GWEN VAN DAM in BOB DAHDAH’s 1964 production of Hello from Bertha, by Tennessee Williams, the Cino’s most frequent author (over 20 productions). Unidentified friend of DORIC WILSON, opening night of Doric’s “And He Made a Her,” Mar. 18, 1961. Doric says the demon figure was one of several as part of the Cino decor at that moment. Oh wow! Mary Boylan, New York film character actress, was a Caffe Cino regular?? This collection of photos is incredible!! I had no idea how small the cafe was until now!